Marshall (2017) recounts one of the most contentious Supreme Court cases in American history, represented by Thurgood Marshall, who would later serve as the first African American Associate Justice of the Supreme Court. Directed by Reginald Hudlin, with Chadwick Boseman playing the title role, the film establishes Marshall’s greatest legal triumph, Brown v. Board of Education of Topeka, Kansas, in which the Court declared the laws allowing for separate but equal public facilities (including public schools) inherently unconstitutional. The case, handed down on 17 May 1954, signalled the end of racial segregation in America and the beginning of the American civil rights movement. In 2013, Henry Louis Gates, Jr., Editor in Chief of the Oxford African American Studies Center, spoke with Larry S. Gibson, Professor of Law at the University of Maryland, whose book Young Thurgood The Making of a Supreme Court Justice recounts the personal and public events that shaped Marshall’s work. Their conversation covered the inconsistent representations of Marshall’s life, and the events that placed Marshall on the path of civil advocacy. HLG: Were there any surprises in your research on Marshall’s life—something that contradicted an impression you or your colleagues had held? LG: Marshall was a much more serious young person and student than others have suggested. One reading the earlier biographies of Marshall would get the false impression that the young Marshall was not a serious student, was not exceptionally intelligent or industrious, and that his success can be attributed to his being a “late bloomer” who came awake in law school. Nothing could be further from the truth…. 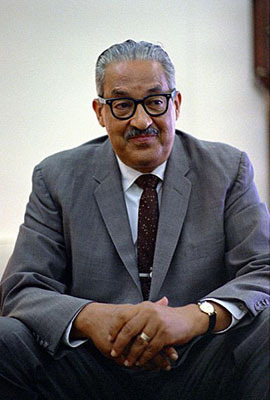 Thurgood Marshall by Yoichi R. Okamoto. Public Domain via Wikimedia Commons. Marshall did not have repeated disciplinary problems in school, as some writers have claimed. He was not sent to the school basement and required to memorize sections of the US Constitution as punishment, as claimed. It is not true that Marshall went to college originally planning to be a dentist and that he changed his plans because he flunked chemistry. On his college application, also reproduced in the book, Marshall said clearly that he planned to be lawyer. Furthermore, the college transcript shows that he got a B and a C in chemistry. In college, Marshall was not repeatedly suspended for pranks. Much of the college lore is built around the telling, retelling, and exaggeration of an incident in which Marshall and one third of the sophomores at Lincoln University were suspended two weeks for hazing freshmen students. Marshall’s involvement was minor, as evidenced by his receiving the lightest penalty of the group. HLG: Within a few days of becoming a lawyer, Marshall found himself involved in the aftermath of a lynching. Your book suggests that this was a turning point for Marshall. Is it safe to say that this incident in particular put him on the path to becoming a national civil rights advocate, rather than a lawyer running a local practice? LG: In October 1933, one week after Thurgood Marshall was admitted to law practice; George Armwood was murdered by a mob in a horrific lynching on the Eastern Shore of Maryland. The next day, Thurgood Marshall wrote about the lynching in a letter to his former law school dean, Charles Houston. A few days later, Marshall joined Houston and eight other lawyers in the Maryland governor’s office protesting the lynching, demanding an investigation and legislative changes. Marshall became and remained an active and vocal anti-lynching advocate. I often wonder what direction Marshall’s career would have taken had three specific incidents not occurred: the first of these being the Armwood lynching. The meeting in the governor’s office to protest the lynching brought Marshall back in touch with Houston. They might have otherwise gone their separate ways. The other fortuitous events were two conventions that happened to be held in Baltimore early in Marshall’s career: the 1934 national convention of the National Bar Association and the 1936 national convention of the NAACP. These two meetings in Marshall’s hometown brought him into direct contact with the nation’s leading black lawyers and civil rights advocates…. HLG: Though Marshall steadily built a reputation as a formidable opponent of segregation, he endured some losses in the courtroom, which your book describes. How did these failures shape his life, outlook, and strategy? LG: In 1936, black citizens were about 15% of the population of Baltimore County, which surrounds but does not include the city of Baltimore. The county had ten public high schools; however, blacks could not attend any of them and had to come into Baltimore City to attend one, overcrowded, high school. For some youngsters, this meant traveling twenty miles daily while passing several public high schools on the way. My book recounts Marshall’s lawsuit on behalf of Margaret Williams, who wanted to go to a county high school near her community. Marshall lost the case, and it was a stinging loss. But, it is remarkable how quickly Marshall brushed off the loss and immediately turned his attention to his next civil rights challenge: the school teacher salary cases. Black school teachers in Maryland counties and throughout the South were paid about half the salary paid to white teachers of comparable education and experience. That was until Maryland state judges and a federal judge in Maryland began to end that practice in lawsuits brought by Marshall, beginning a few months after the Baltimore County high school case. After Marshall relocated to New York to work for the national NAACP, he replicated the Maryland teacher salary cases in nine other states. A version of this post was originally published on the Oxford African American Studies Center. Featured Image Credit: “US Supreme Court Building” by MarkThomas. CC0 Creative Commons via Pixabay. 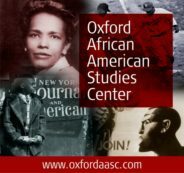 The Oxford African American Studies Center (AASC) combines the authority of carefully edited reference works with sophisticated technology to create the most comprehensive collection of scholarship available online to focus on the lives and events which have shaped African American and African history and culture. As well as over 10,000 articles by top scholars in the field, AASC provides over 2,500 images, more than 450 primary sources, and nearly 200. More than 150 charts and tables offer information on everything from demographics to government and politics, and from business and labor to education and the arts.